So far I have participated to two meetings. I don’t think I will miss any in the future. From Tuesday 12/2/13 I will be contributing to the work of the committee responsible of writing the constitution, effective participation to AU legacy projects and shaping UK branch of the AU 6th region that constitutes African Diaspora. 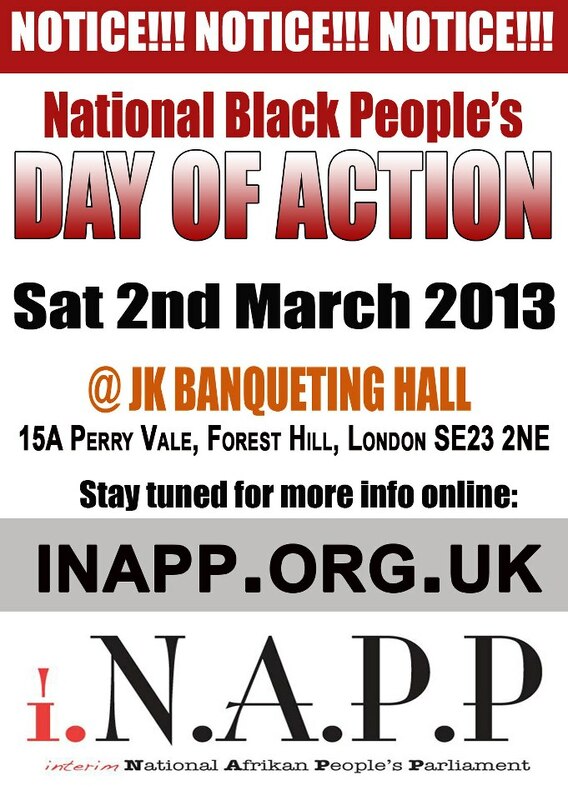 In the meantime, I am looking forwards to the Saturday 2nd March 2013, the National Black People’s Day of Action. It all started in 2011. On March 2nd, 1981 – 25,000 people took to the streets for the first Black people’s day of action, protesting against the New Cross massacre and other racial injustices. Their efforts demonstrated the power potential of the Black community (UK) in unity and solidarity, which began to break down racialised barriers. In 2011, community activists and organisations called a commemoration of the 30th anniversary of this powerful event, not only for remembering the past, but analysing the present and planning for a better future. Not only was it clear that a new generation had little or no knowledge of this history, the Afrikan (Black) community continued to endure the same injustices we protested 30 years before – and more. The Black people’s day of action, 2011, declared March 2nd a National Public Holiday, with the vision of creating a National Afrikan People’s Parliament, as a mechanism for our empowerment and implementing solutions to our problems. Many organisations, groups and individuals are working together to make this vision a reality. So why not join us (if you are Afrikan in UK particularly) on the day of action and play your part. Help us build the National Afrikan People’s Parliament. This is our day, so: Take time off work, college, university, close your business and take your children out of school for the day. Together let us pay homage to the actions of the past – take command of the present – and enact the power to determine a better and brighter future for our children. Commemorate, Evaluate, Organise to Liberate!!!! This entry was posted in Africa and tagged iNAPP, New Cross Massacre, UK. Bookmark the permalink.